In 2009, TPL and the U.S. Forest Service protected a 2,500-acre property of privately held land within the Wasatch Cache National Forest by bringing it into public ownership. Preserving the Bear Canyon property was important in protecting the integrity of the forest and dramatically increases the expanse of public lands by linking it to the Lone Peak Wilderness Area and Corner Canyon. These forested lands provide clean drinking water for the nearby communities and habitat for native wildlife and fish. 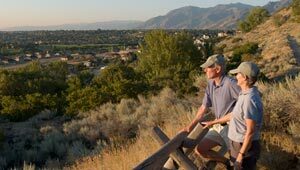 The Bear Canyon property also added over one mile of new trail to the Bonneville Shoreline Trail and expanded public access to it for hikers, runners, bikers, and families to enjoy the outdoors.